As is Paul Weller’s habit, he enjoys producing albums of differing natures. This is certainly one of those. It is an album based around an acoustic, folk ambience. It is something he has certainly dabbled in before, notably on “Wild Wood”, and he has always had a bit of bucolic in his soul. However, this time it is the entire album. It is delivered in a mellow, laid-back fashion. If you are expecting “The Changing Man” or “Wake Up The Nation”, you won’t get it. Weller, unusually, changes his vocal style from track to track, and this is taking a bit of getting used to for me. Another new thing is that he is using other lyricists on some songs - Conor O’Brien and Erland Cooper. I have to admit an ignorance of these two folk and folk rock artists, respectively. “The Soul Searchers” is a lively, melodic opener, with a fetching acoustic guitar intro and a relaxing, folky, but slightly contrived-sounding Weller vocal. The song breaks out into a lovely bass and low-key drum rhythm and is most appealing, with a jazzy keyboard part. The instrumentation on this is top notch. It just takes a bit of time to get used to Weller’s voice. Is it deliberately high-pitched, like Bruce Springsteen’s on parts of “Devils And Dust”, or is it just the way it is going as he ages? Either way, it is a great track with hints of “If I Could Only Make You Love Me” from “Studio 54”. Another thing that hits you also is just how good the sound quality is, something that has not always been the case on Weller albums. “Glide” is a wistful acoustic and strings mellow number that just sort of washes over you. “Mayfly” has a deep, warm guitar intro and a more typical Weller vocal delivery over some folky percussion backing. There is some nice bluesy guitar on this one too. “Gravity” actually has echoes of some of the material on “22 Dreams” but it is given a sumptuous string backing here. Impressively meditative. “Old Castles” has a shuffling, jazzy backing and has Weller harking back to “Heliocentric” in his vocal style. “What Would He Say?” has a Burt Bacharach-esque relaxing brass solo that surfaces a couple of times and an “easy listening” melody with dreamy lyrics. “Aspects” is a gentle, Nick Drake-ish bucolic tender ballad. Again, Weller’s voice is a bit of an acquired taste on this song. As for the song, “Bowie”, I have already seen it hailed as Weller’s tribute to David Bowie. Apparently, though, Erland Cooper is the lyricist. I have to say, though, I find the whole Weller/Bowie thing a bit odd. He spent years slagging Bowie off, then a few years ago claims to be a great fan of “Low” and goes and names his son “Bowie”. Always a man of often incomprehensible contradictions, Weller. “Wishing Well” is a tender acoustic, very folky, reflective number and “Come Along” ploughs a similar furrow. “Books” has some mysterious, Eastern-sounding backing and again it is so laid-back as to be almost comatose. It has some beguiling string instrumentation to it, with some excellent, evocative violin. “Movin” On” is a beautifully orchestrated number, with some winning percussion and a soulful, expressive vocal from Weller, more in the style we have come to expect back from the nineties. It has some lovely brass parts near the end. A delightful track. One of the best on the album. I have to say, though, that by now I am getting a bit relaxed-out, man. Contemporary albums are often over an hour long, contains fourteen or so tracks like this one. Sometimes I think the old seventies-style forty minute, ten track offerings have more effect. “May Love Travel With You” is a bit like “Where’er You Go” from “22 Dreams”, but with a massive, neo-classical orchestration. Weller has certainly never done anything like this before. 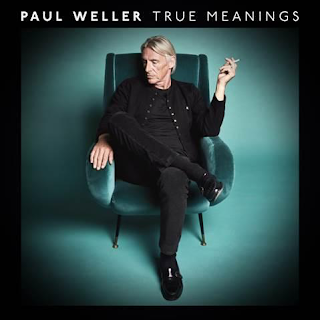 “White Horses” is a plaintive, quiet closer with Weller again adopting a higher pitch to his voice in places. It breaks out into a heavier passage in its middle. I am writing this on first listening. I suspect this is an album that will require repeated listens. I feel that I will rarely listen to it in one sitting, however. It is too much in the same mood for too long for me. Its tracks will probably be played in a “Paul Weller random” playlist. It is then they will be more effective, personally, as opposed to one chilled-out song after the other. Others may love to sit taking it easy for an hour or so, though, late at night. It is, I feel, a grower, that seeps into your consciousness. Three plays or so later and it certainly is captivating me. Fair play to Weller for diversifying yet again, however. He is an artist still developing and evolving, all these years later. You can’t argue with that. 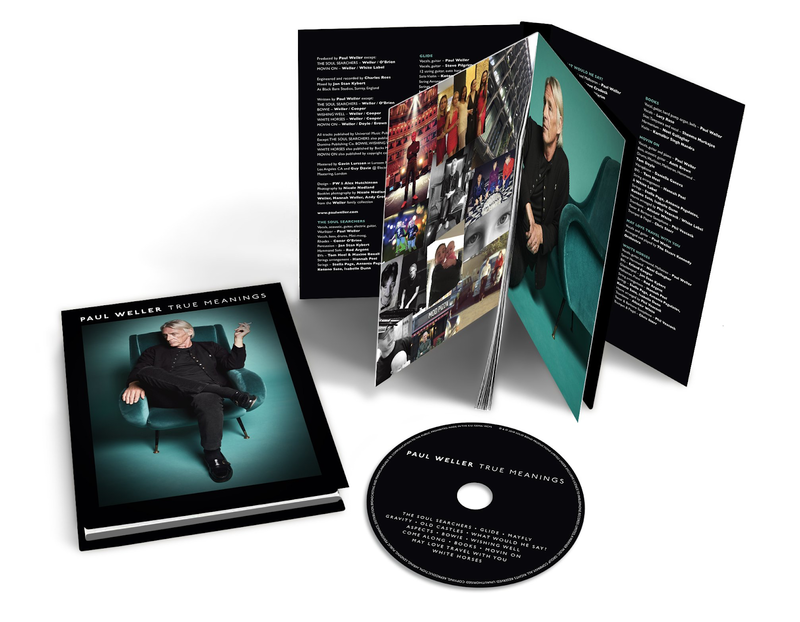 PS - "The Soul Searchers", "Aspects" and "Mayfly" are given thumping clubby remixes on the "deluxe edition", which are interesting. I certainly enjoyed the funky (in places) version of "Mayfly".